The findings—by researchers from 36 institutions—have been published in the journal Nature Communications. In his part of the sequencing project, Werren discovered 805 possible instances of genes being transferred from bacteria within the bed bug to the insect’s chromosomes—a process called lateral gene transfer (LGT). Chromosomes routinely break and are then repaired in organisms. The most common repair mechanism is called homologous recombination in which similar genetic material is used as a template in piecing the broken chromosome back together. But, periodically, the repairs go badly and foreign DNA is incorporated into the chromosomes—in the case of C. lectularius, that DNA includes genetic material from bacteria. One exception involves the transfer of a patatin-like gene from the Wolbachia bacteria. Patatin genes help organisms to store and cleave starch and lipid molecules. The gene, transferred from the intracellular bacterium Wolbachia to C. lectularius, appears to be functional in the male bed bug, but not the female. 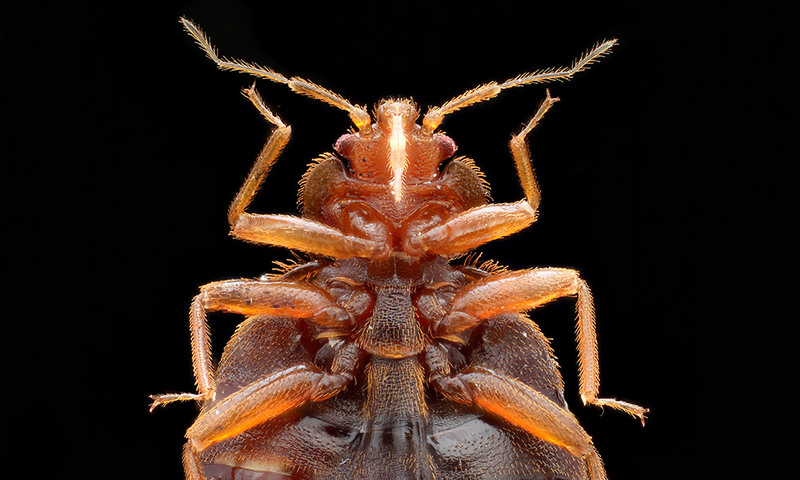 “Because the inserted genes create unique genetic profiles in bed bugs, they have the potential of becoming effective targets for pest control,” said Werren. A great deal more work needs to be done before any eradication steps can be taken based on these results. While 805 candidate sites for LGT have been identified in the common bed bug, Werren says only six have been confirmed, so far, as actually having received genetic material from bacteria. Of those 805 candidate sites, 459 have been attributed to the Arsenophonus bacteria, and 87 from Wolbachia, both of which are common bacterial associates of insects.